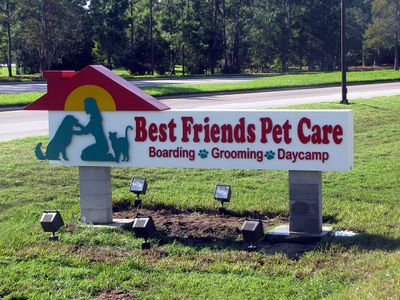 Best Friends Pet Care is located across Bonnet Creek Parkway from Port Orleans Riverside Resort. Photo by Vance Cope. Walt Disney World's newest resort opened on September 1, offering luxurious suites, exclusive water park, and full-service salon. If you're hoping to book a room there for yourself, though, you're out of luck; all of the amenities are for pets. 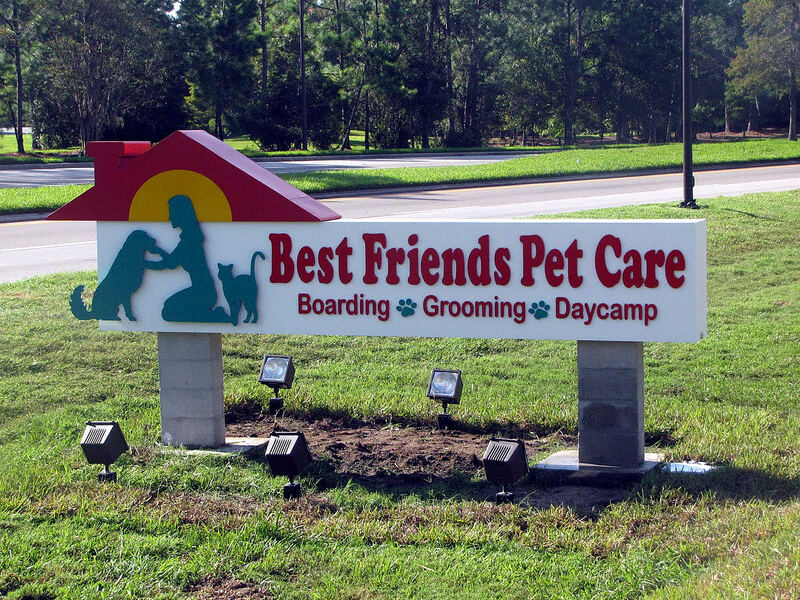 Located on a 50,000-square-foot complex across from the Port Orleans Riverside Resort, Best Friends Pet Care opened its new pet boarding and daycare center, offering a wide variety of accommodations and services for up to 300 dogs, cats, and "pocket" pets. The entrance of the new pet resort features a Disney-style theme for your furry friends. Photo by Vance Cope. Inside the 17,000-square-foot, air-conditioned building, Best Friends has made sure to provide all the comforts for its four-legged guests. 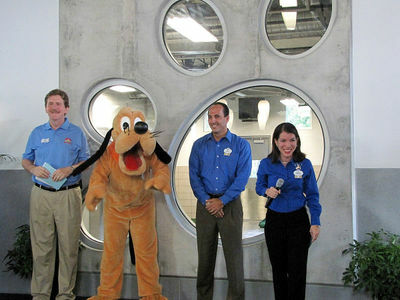 Best Friends CEO Dennis Dolan, Pluto, Disney Parks & Resorts Vice President for Operating Participants Phil Bernard and Walt Disney World Ambassador Vanessa Rosas stand in the lobby, which features a giant paw print-shaped window that looks into an indoor play area, as they preside over the center's opening ceremonies. Photo by Vance Cope. The outdoor play area features grassy areas, a water park, a dog run and more. Photo by Vance Cope. 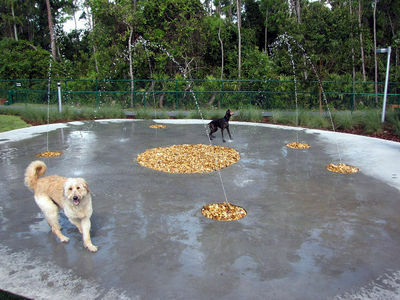 A pair of dogs enjoy playing in the spray of the water park. Photo by Vance Cope. Along with overnight boarding and daycare services, the complex also offers a full-service grooming salon and two 1,100-square-foot doggy day camp rooms. 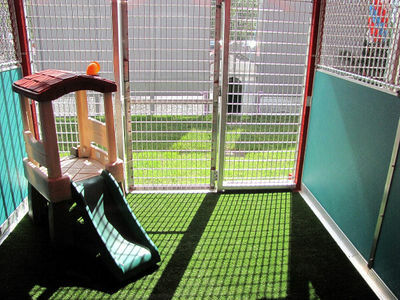 The patios of the VIP suites include dog-sized playsets. Photo by Vance Cope. 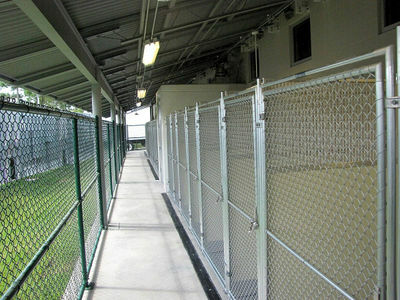 Outside is a private 25,000-square-foot, fully fenced, off-leash dog park reserved for the exclusive use of the canine patrons at Best Friends. 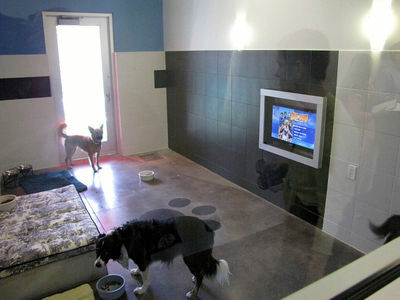 Dogs enjoy checking out the inside of a VIP suite. Photo by Vance Cope. 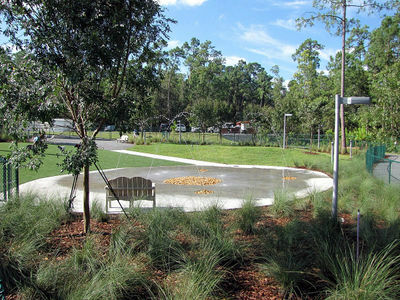 The dog park includes a walking trail along the perimeter of the park, a play area covered in artificial grass, a grassy knoll with shade trees, and a 1,300-square-foot “Splash and Play” water feature for dogs. While smaller than a VIP suite, the vacation villas are still quite spacious. Photo by Vance Cope. Kitty City offers two- and four-level cat condos for your cat. Photo by Vance Cope. Standard indoor kennels still provide quite a bit of space to move about in. Photo by Vance Cope. 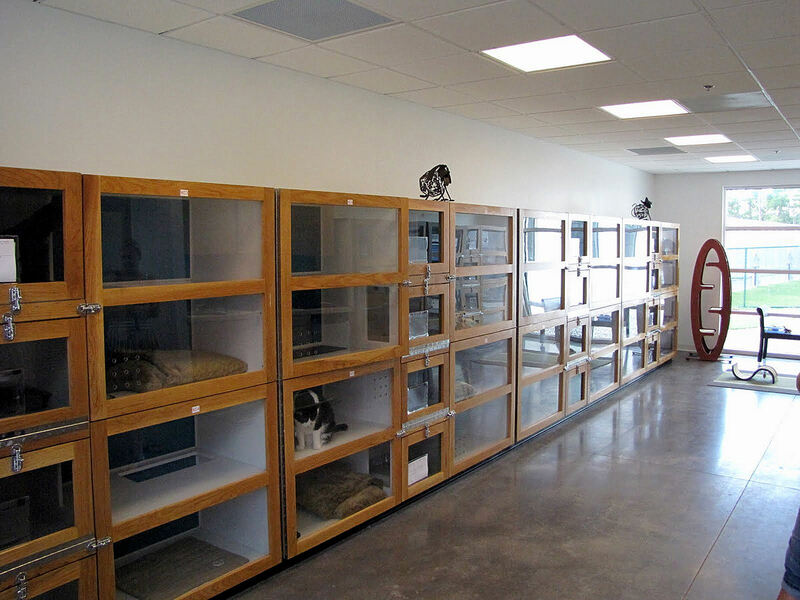 Best Friends Pet Care also has a room set aside for “pocket pets” such as hamsters, rabbits, ferrets, and fish for those who wish to board their smaller animals. Owners must provide all of their own housing/cages, supplies (such as food and bowls) and bedding (such as litter and wood shavings) for their pets during their stay. Fees range from $12 to $23 ($10 to $21 for Resort guests) per day depending on size and type. Best Friends does not accept exotics, venomous animals, or primates for boarding. 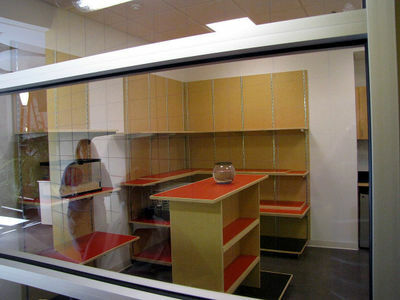 Other pets can be accommodated in the "pocket pets" room. Photo by Vance Cope. For those not wishing to board their pets overnight, daycare and daycamp rates are available based on the amount of time your pet is present and the type of accommodations your pet uses during that time. 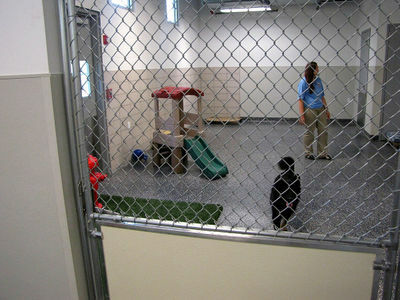 Daycare includes boarding in a doggy suite, while day camp is a "group socialization session where dogs spend the day in exercise and play with other dogs under the supervision of a trained counselor," and requires that the dog be spayed or neutered. On a space available basis, dogs boarded for daycare can participate in day camp as well. 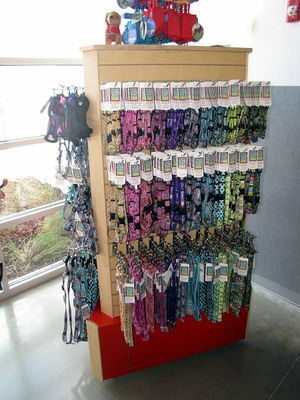 In case the facilities aren't enough by themselves, you can also buy treats and accessories for your pet. There is, of course, a wide variety of merchandise available in the gift shop. Photo by Vance Cope. Best Friends is open every day of the week, and opens an hour before the earliest park opening through one hour after park closing, with the facility staffed around the clock in case of emergencies. 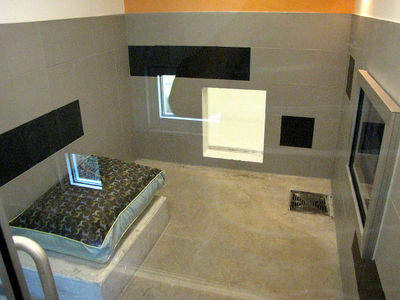 Check-out time for all overnight guests is noon, unless you wish to take advantage of the daycare services. Dogs must be current on Rabies, DHPP, and Bordetella vaccines, while cats must be current on Rabies and FVRCP. 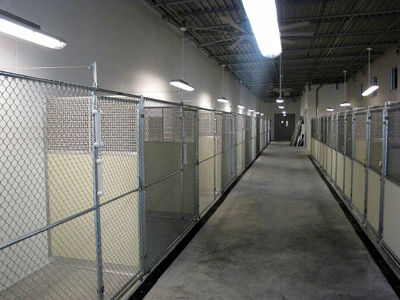 Larger indoor kennels provide more room for bigger dogs to move around. Photo by Vance Cope. 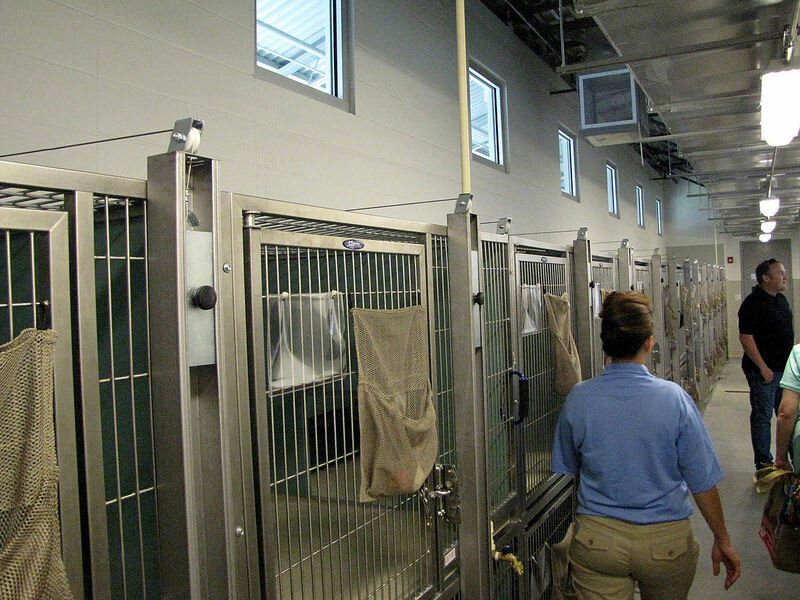 Best Friends, who has operated all of the kennels in Walt Disney World for the past two and a half years, has closed all of the other kennels on property as of September 3 with the opening of this larger and more central location. 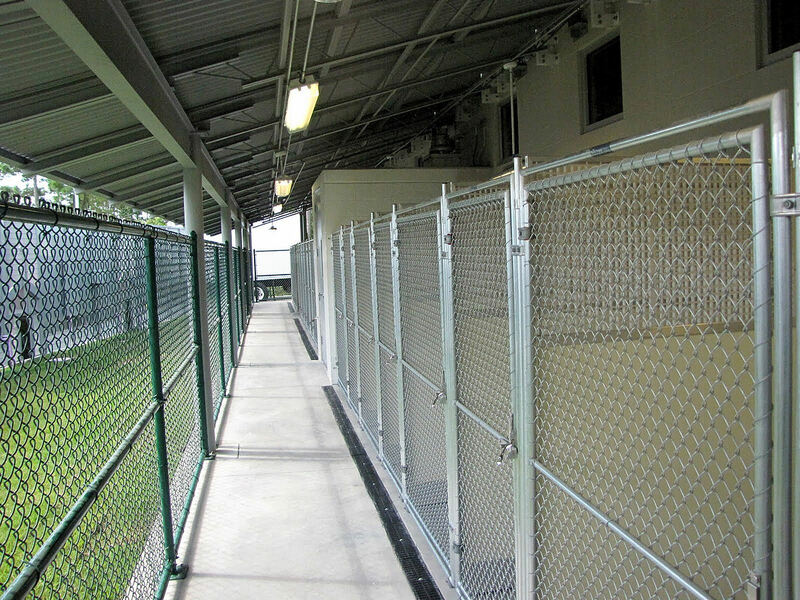 Indoor-outdoor suites provide free access to the fresh air for your pooch. Photo by Vance Cope. Discounts for multiple pets sharing the same suite are available, and if you are a Disney Vacation Club member or an Annual Passholder, be sure to let the staff know when checking in and you will receive a $2 discount (if you are staying on property, this discount is in addition to the discounted Resort guest rate). Best Friend Pet Care coupons from out of state are not accepted. For more details on reservations, pricing, services and hours check their Web site (link) or call 1-877-4WDW-PETS. An indoor play area ensures that pets can get some exercise even in inclement weather. Photo by Vance Cope. In reference to the long phone number, it's common in advertising to match a phone number with a name, and if the name is too long just ignore the later numbers. For example if you're told to call 1-800-rocketrods, you would actually dial 1-800-762-5387 and then just ignore the rest.